Today, we extended the modular LucidControl product series by the AO4 – USB Analog Output Module. The new USB powered devices generate 4 independent analog voltages and are available in two options with 0 to 5V or 0 to 10V outputs. The DIN Rail mountable DAC devices come with an accuracy of 0.25% and a high precision resolution of 12 bit. They are best suited to generate 0 to 10 V interfaces as they are wide-spread in automation and building sector. The Analog Output USB Devices are the perfect solution for home automation and factory floor automation applications where e.g. the flow through pumps or the power of central heating units should be controlled by a voltage output. Together with the AI4 Analog Input Module which measures and processes analog input signals, the Digital Input Modules and Digital Output Modules LucidControl provides a complete solution for analog and digital data acquisition, data monitoring and control tasks. By default all voltage output sources share a common ground with the host computer. By combining two of the four channels to one it is possible to create up to two floating output voltages per module without having a common ground line. If negative voltages are needed for a specific purpose, the LucidControl AO4-12S Analog Output Module is able to generate voltages from -12V to +12V. In combination with the floating output principle this module is able to provide two voltage lines of -24V to +24V. 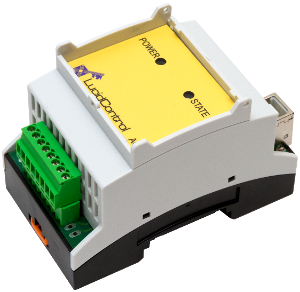 Click here for an overview of the versatile LucidControl USB IO Modules – the unique and simple to use solution for most automation projects. Data which are acquired by a system like LucidControl need often being monitored in real time. One method which is very efficient is a diagram recording values over time. Especially for temperatures this is a very illustrative way which gives lots more information than pure numbers in a table. 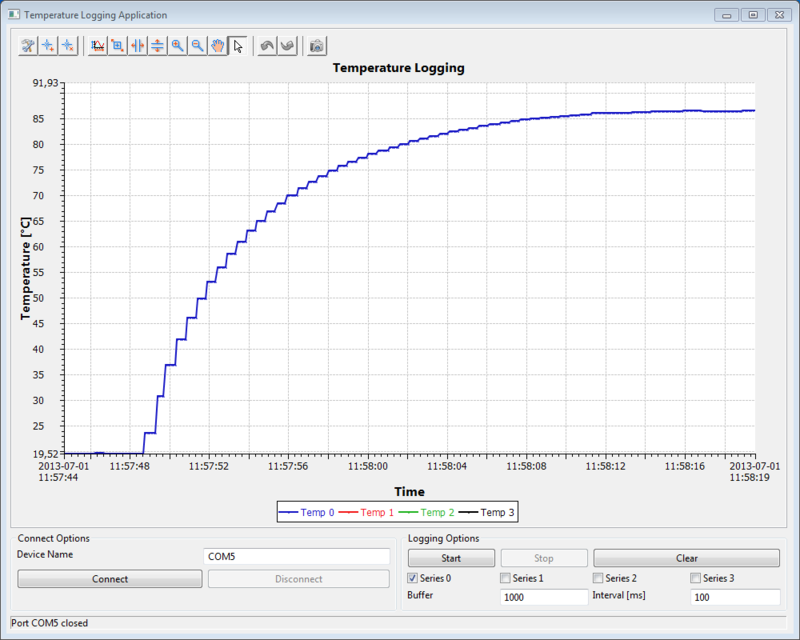 In the animation you can see a recorded temperature logging diagram which was made by using our LucidControl RT-4 RTD input device. It shows the behavior of a Pt1000 temperature sensor (RTD) which was at first put into warm and afterwards moved to cold water. It is obvious that the temperature follows an exponential function ex which is the case for many physical quantities. One additional example for exponential behaviour is the charging and discharging of a capacitor. The question is how can such a diagram be created in your application and how does it run on the Raspberry Pi. In the following article shows how an application which records a diagram can be created and which tools are necessary. As development environment Eclipse IDE is needed. The final project can be downloaded and it can be imported including the sources to Eclipse directly. Of course the Java Development Kit is needed in order to create the application. This application should work with most JDKs, but I’m using Java 7. Download and install the Standard Widgets Toolkit. Setup the LucidControl Java API in order to access the LucidControl RT-4 USB IO device. Which Charting Tool fits best for Data Monitoring? JFreeChart is probably the most comprehensive free tool having lots of different chart options. swt-xy-graph is a very good application for line charts and has a great implementation of real-time charts. SWTChart is a fundamental chart tool and supports different styles. The charting tools are made for different use cases and not all are suitable for real-time monitoring. BIRT for example was made for business reporting. For this application JFreeChart and swt-xy-graph seem best suited and we went for swt-xy-graph because it was especially designed for dynamic charts and it can be used for RAP (Remote Application Platform) applications. Download swt-xy-graph and read the documentation. Download the lucidio.example.tempLogSwtXy project sources or check the download section for more information. The project archive should be unzipped to some directory on your computer and it can be imported to your Eclipse workspace afterwards. Please check if all the necessary libraries are in the build path and download missing libraries if necessary. Learn from the examples source code. It is quite simple and together with the swt-xy-graph documentation it should be possible to understand what is ongoing.